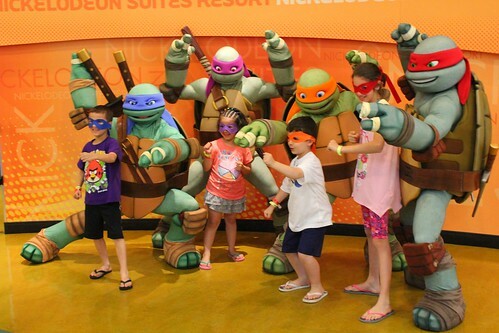 Now appearing daily at the Nickelodeon Suites Resort in Orlando are the heroes in a half shell, the Teenage Mutant Ninja Turtles. 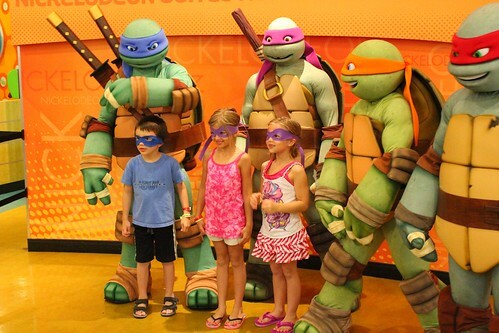 Guests staying at Nick Hotel have daily opportunities to meet Leonardo, Michelangelo, Donatello, and Raphael, fresh from of their upcoming revival on Nickelodeon. 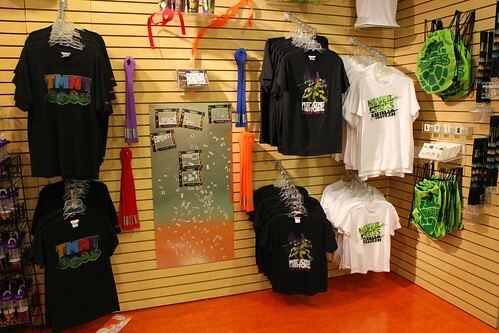 The meet-and-greet location is in the hotel’s “Mall,” also home to a food court, arcade, 4-D movie theater, and the Nick Studio venue. 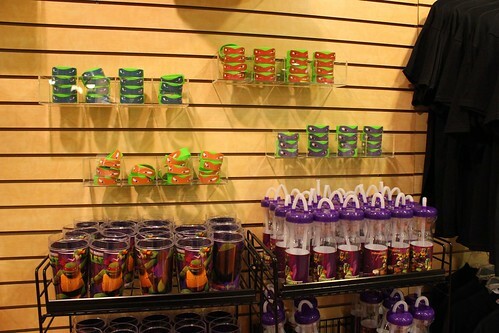 The nearby shop sells a few TMNT items, including T-shirts, mugs, wristbands, and – most importantly – red, orange, blue, and purple eye masks, a popular item among kids eager to meet the fearsome foursome (and a bargain too, at less than $3). 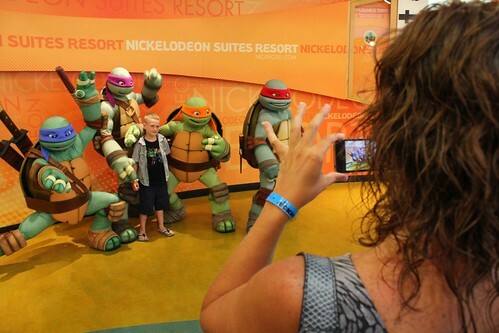 As with the many character photo opportunities available at Nick Hotel, long lines can form quickly so it’s recommended guests find out in advance when the Ninja Turtles will be appearing and show up 10-15 minutes early. 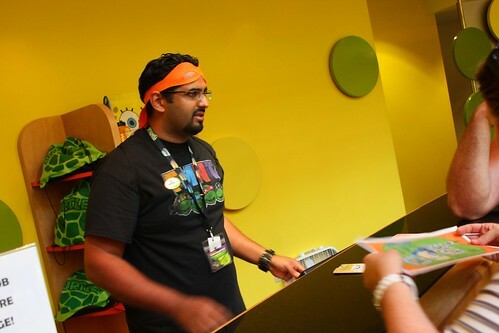 Though, to the credit of the hotel’s staff, the line does move very quickly, but without ever rushing anyone through the experience. 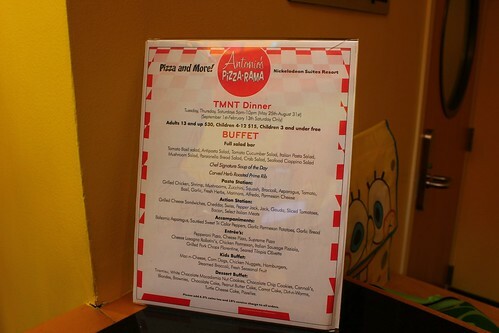 Those looking for more time with the Turtles can dine at Antonio’s Pizza-Rama, where on select nights all four of the Teenage Mutant Ninja Turtles will appear and teach a few ninja moves. 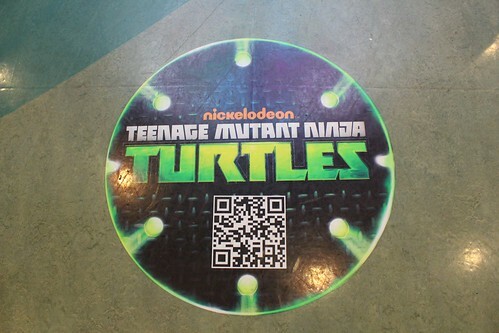 The Turtles’ new half-hour CG animated series called “Teenage Mutant Ninja Turtles” will debut on Nickelodeon in Fall 2012. 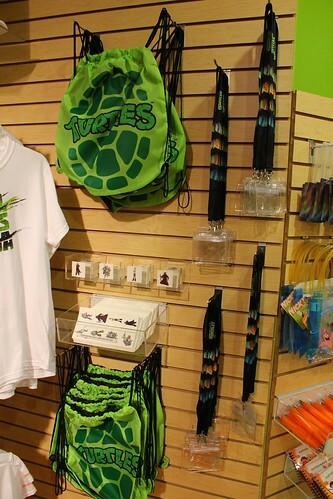 When I was a kid I wanted to be a ninja turtle when I grew up, but my mom said it would be too expensive and I should go to college instead. Now I’ve got lots of student loan debt and I also found out that ninja turtles aren’t real. 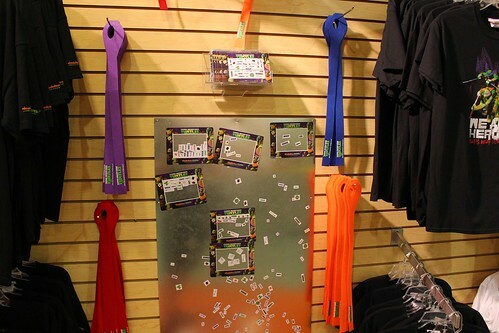 Do you know how long they will be appearing at the Nick Hotel for? Are they out all day? They’ll be there throughout the summer, but times and lengths will vary each day. On the day I was there, they were only out once at 7pm for around 20 minutes.